1941 Octopus Furnace. Asbestos insulated octopus arms (ducts) supply heat to rooms..
Do you have a vintage house? Does it still have an old Octopus Furnace? Vintage Parlors are nice but they’re a dime a dozen. It’s rare you see a kitchen that matches the period of the house. More rare to find a vintage furnace! This however, is the stuff your guests will remember. My house was built in 1910 but unfortunately I do not have a 1910 furnace. It’s possible that the kitchen stove heated part of the house and the rest remained unheated. 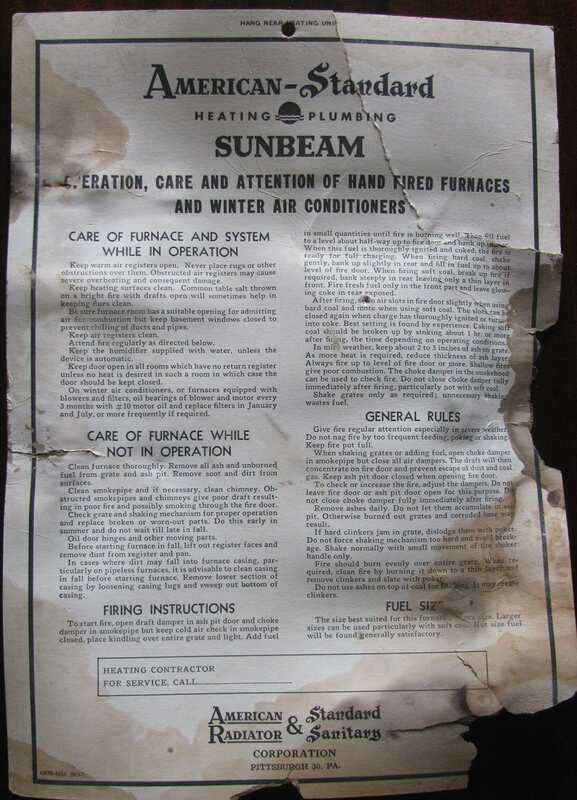 In 1941 however, a brand new American Standard/Sunbeam Octopus Furnace was installed to provide central heating. The octopus furnace was a coal burning gravity hot air type. 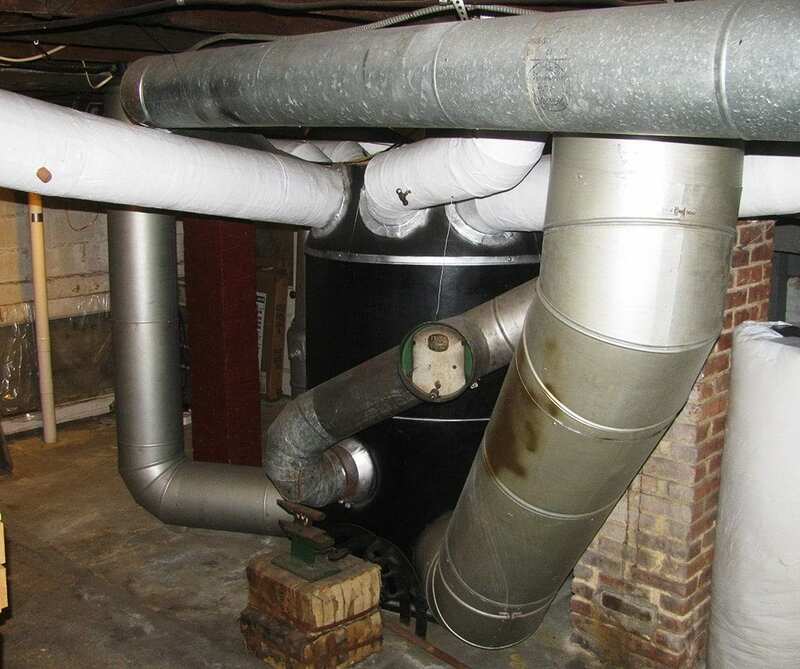 A gravity furnace heats the air and the hot air slowly rises through a duct system as hot air always rises. Rear view: White painted asbestos insulated arms supply heat. 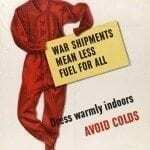 Un-insulated arms supply fresh air. Center duct vents to chimney. There was no fan to force the air on this model. Just blasts of very hot air naturally rising through the ducts. The reason this furnace is called an Octopus Furnace is because of the duct-work. Each heating vent has it’s own duct that attaches directly to the furnace giving the furnace the look of an octopus. Today several ducts can branch off one duct. 1887 Hess Furnace. Coal Burning Hot Air. Style has not changed much comparing 1887 and 1942. Many earlier octopus furnace were highly decorated. 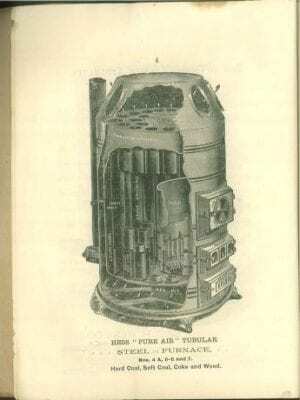 In 1885 the first riveted-steel coal furnace was built. Without electricity and fans to move air, these early furnaces transported heat by natural convection (warm heated air rising) through ducts from the basement furnace to the rooms above. 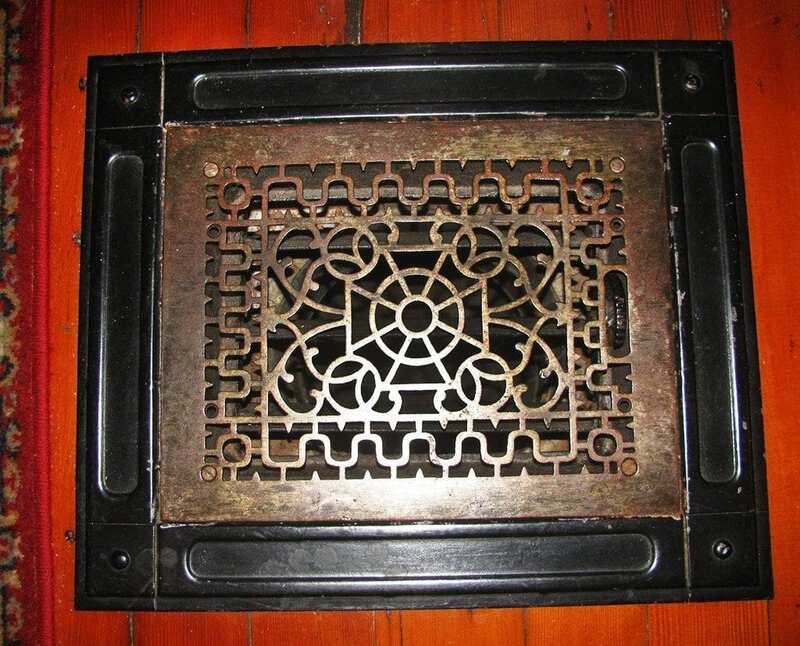 Around the same time, the invention of low cost cast iron radiators would change home heating. Now homes with a coal fired boiler in the basement could deliver hot water or steam to radiators in every room. These two methods would dominate home central heating until 1935, when the introduction of the first forced air furnace using coal as a heat source used the power of an electric fan to distribute the heated air through duct-work within the home. Soon gas and oil fired versions of forced air furnaces would relieve the homeowners from the chore of “stoking the coal fire” and relegate coal furnaces and cast iron radiators to the dust bin of history. Although central heating was available in the later 19th century, many average houses did not have “central” heating until the later 1930’s. Combination stoves heated the space with wood for winter cooking and heating and gas for summer cooking. Top door- vapor pan, add water for humidification. Center door – feed door to add coal. Bottom door – ash pit door, now oil attachment. 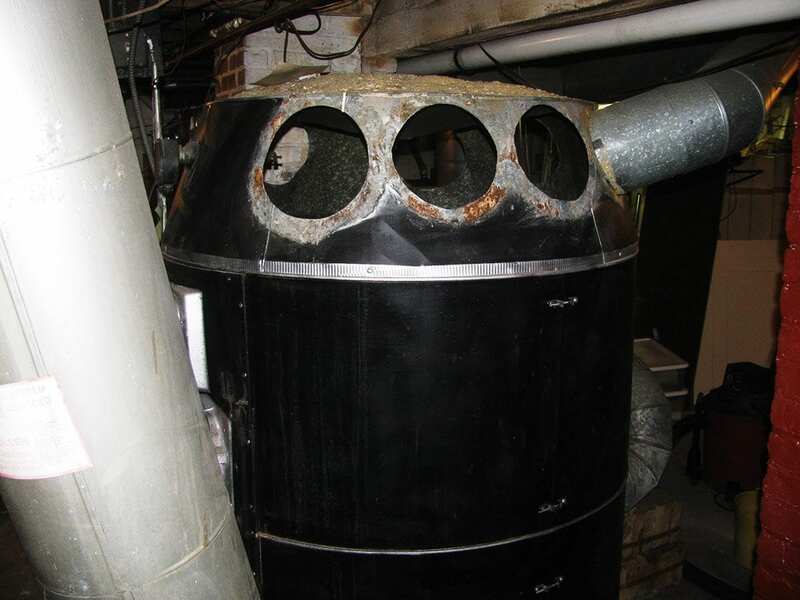 When this Sunbeam coal furnace was installed in 1942, the basement floor was dirt except for the cement platform for the furnace. Coal was delivered into a nearby basement window. Below the window was a sort of pen where the coal was stored. 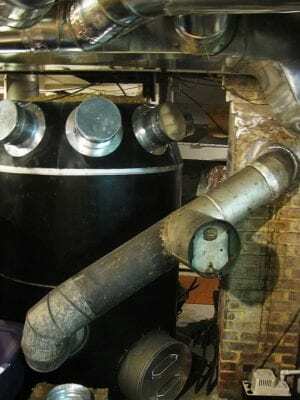 This coal burning octopus furnace was converted to oil sometime during the 1950’s when oil was very cheap and popular. Some of what they saved was the grating to lay the coal on, the lever to shake off the ashes, and the crank to dump the coal. They even saved the instruction manual (link at end of article) explaining how to put the furnace together and light the coal on fire. Thankfully the owners at the time were historically minded and kept all the coal burning parts when removed for oil conversion. 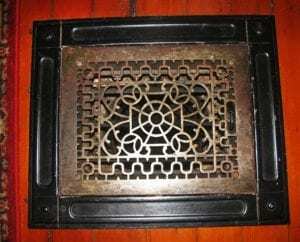 Coal furnace grate. Coal lays on grate. Turn crank for cleaning and coal will fall into ash pit. Coal furnace converted to oil burning. This mechanism fires burning oil into the oven. This was formerly the ash pit. Door is still attached. Now oil is expensive. The furnace is probably about 50-60% efficient. To make it affordable, I keep the heat very low and dress warmly. This is part of experiencing life in a real historic house. We must adapt to the house – the house should not be adapted to lazy owners. There is a door on the furnace with a shelf. Soap stone bricks heat up there and are wrapped up in a towel to be placed at the foot of the bed for extra warmth during the night. The machine that burns the oil is loud and smells like oil. I was told by oil servicemen that this furnace will last a long time with little maintenance. Here is a video showing and hearing the old octopus furnace in operation. Is There a Future for this Old Octopus Furnace? Feed door open showing fire pit and bricks heating. Although most people never consider mechanical systems as historically important, they are and should be preserved. 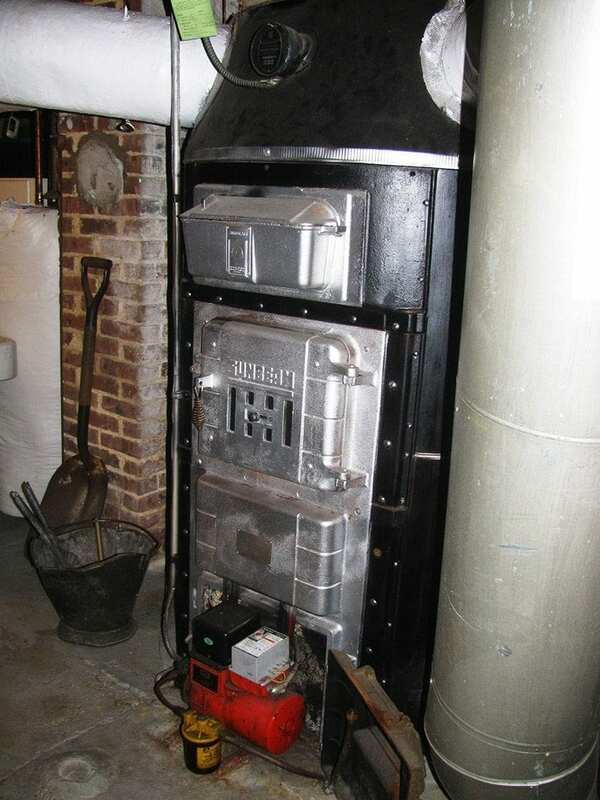 This old octopus furnace is historic and part of the evolution of the house. This furnace is now rare and cannot be replaced. There are less and less of these around. It’s conversation piece to show guests and looks so good to show off. I am responsible for this artifact and should not be selfish about saving on my heating bill but do what is right for the house. People would never throw out an antique piece of furniture (well not most) but they rarely care about an antique furnace. This old octopus furnace is more interesting than many people’s Victorian parlors. Heat register in first floor parlor. What Happens After I’m Gone? One of my main concerns was that if anything happened to me and the house was sold – what happens? The new owner would most likely get rid of this beautiful antique. They will replace it with a boring looking new furnace that has no personality – probably similar to its owner. I restored this house not for my amusement but for the purpose of preserving a bit of history for the future and so others can learn from and appreciate my beliefs – what you are now learning from this website. My efforts are rewarded by the look on my guests face when I take them into my basement to see the furnace. 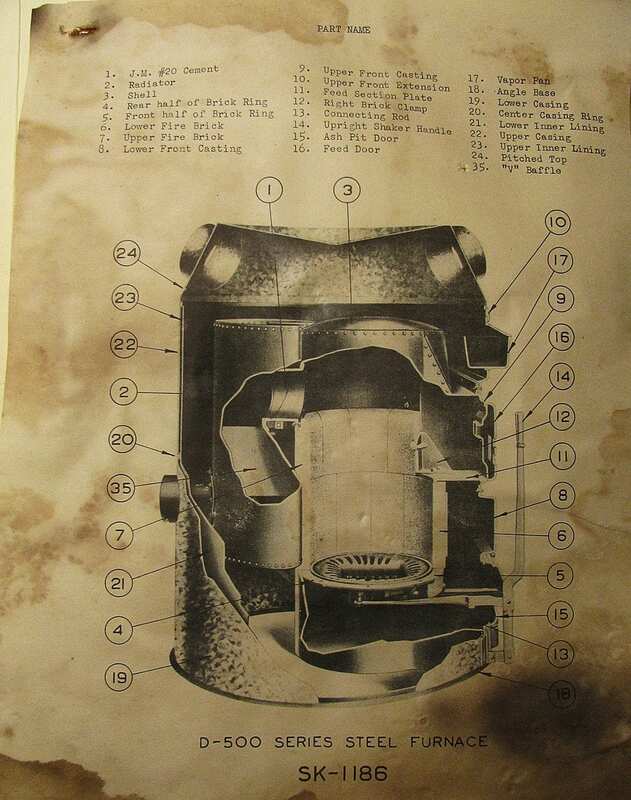 1942 American Standard / Sunbeam gravity coal furnace parts diagram. Show someone a valuable work of art hanging on a wall and an old octopus furnace and see what they remember of their visit. Heating Options to Protect this Furnace for the Future. Coal furnace operating instructions. Stoking the fire, removing ashes etc. See the link at end of article for complete enlarged instruction manual. One way I can preserve this old octopus furnace is by converting it to gas and make it more appealing and affordable for future owners. Oil is environmentally bad and is very expensive. An oil to gas conversion would be a big improvement. However I was told it can’t be done for the system is not sealed enough. I joined Angie’s List and talked to one HVAC person who suggested putting a new high efficiency furnace behind the old octopus furnace and route the heat from the new furnace into the old. I thought this was a great idea but never heard back from them and all other HVAC people did not want to do that. Old octopus furnace ducts removed during asbestos remediation. After some time the final decision was to convert from oil to gas and install a new high efficient furnace. The old octopus furnace will be disconnected but kept as a show piece. An easement will be put on the house preventing future owners from removing it. When you make modifications to anything historic or potentially historic you need to consider its future and making your changes reversible. In the future, it is possible that this old octopus furnace can be used again. It would need an oil tank and oil line and new ducts. The original fabric and mechanics have not been compromised. While a new oil tank etc would be an expense, you never know what the future brings and how the rarity of this furnace will increase. Old octopus furnace ducts replaced and capped off. Chimney exhaust is kept for looks and possible future useage. The first step was removing asbestos. All my asbestos ducts had been safely encapsulated with paint making them appear like new. They were removed from the old octopus furnace and new duct work was installed on the new furnace. Now a new 95% efficient Rheem Gas Furnace heats the house. On the old octopus furnace the asbestos ducts that were removed were replaced with new short metal caps to show where the ducts were originally. New non-asbestos ducts can be connected if needed. One of the giant size returns measuring about 20 inches wide was removed and capped off. Electric and oil were disconnected. This can all be reconnected if needed. The furnace is still connected to the chimney. It is possible the future owners may be shallow minded and think I was crazy for saving it and prefer to have the extra space. However, I am sure after more years, owners after them will appreciate being stewards of something so unique. A preservation easement will assure my wishes are carried out. As easement such as this is something everyone should think about for life is short and our legacy should live on. Do any of you still heat with coal? Fascinating! I was glad to read about this. We have the original 1904 octopus furnace in our house. It was converted to gas from coal in the 1950s, before we bought the house. What’s interesting is that the cold air returns are huge round tiles beneath the basement floor. There’s also a cold air intake under the front porch – about 24 inches in diameter. I like the smooth even heat that gravity provides. The new, high efficiency furnaces, tend to blast you out with heat for a little while, then turn off, with no residual heat from hot cast iron wafting up. I’ll be curious to see what your heat bills are, compared to your old furnace. I’ve compared mine with new gas furnaces (although most neighbors aren’t willing to share), and find that the payback period for a new furnace could be decades. 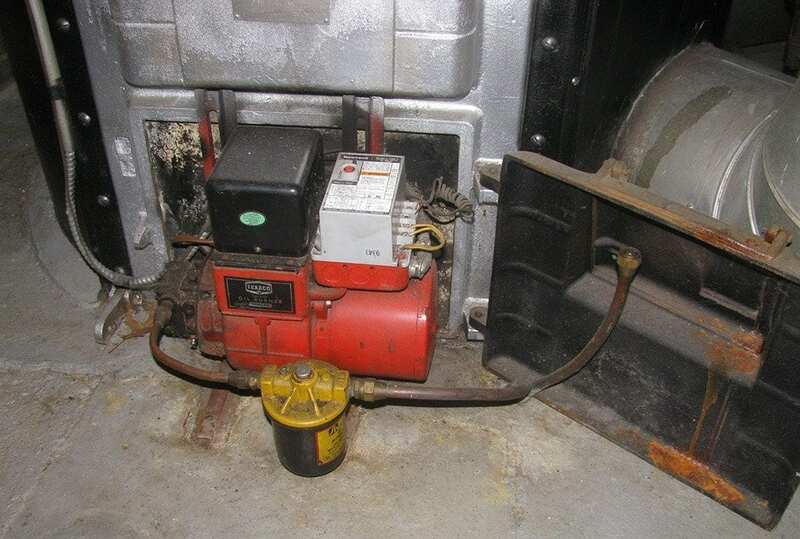 There’s really no maintenance on an old gravity heater – no pumps, electronic controls, etc. The one thing that I think would significantly increase efficiency is if I could get a flue damper that closes, then opens automatically when the gas turns on. Warm air does go up the chimney from the basement all the time. from the flue diverter. Nobody seems to know anything about such dampers. They are called double barometirc drafts and swing bothe ways. You also need a spill switch that shuts off the burner in case of a blockage causing co to spill into your house. check out heatinghelp.com. It’s THE BEST forum on heating issues and especially old systems. The top experts frequent it. I live in Detroit, and have two function Sunbeam gravity furnaces in my two unit building built in 1914. These furnaces were converted from coal to gas somewhere after the mid 1920’s. There are many of these style building with the identical furnace design in the city. Different than anything else I’ve read on the internet, these furnace systems work without cold air returns. They use a large duct, 16 or 18 inches in diameter, bringing air directly from the outside into the base of the furnace, supplying outside air for combustion and heating. The hot air rises and pressurizes the rooms in the apartments, seeping out through all of the cracks in the housing construction of that era – but with solid plaster walls, and well designed original slotted window weather protection, that is not as much seepage as I would have originally thought. I have never experienced a heating system that is as comfortable as this provides. No noise, little dust, and a continuous heat with extremely minor temperature fluctuation. With all of the registers turned full open, there is nearly no drafts through the rooms of the apartments. The rooms are simply fully pressurized with warm air and it is seeping slowly out where ever it can. The air in the rooms is always fresh. When I purchased the property 26 years ago, I was immediately told by contractors to replace the furnaces, but the city inspection showed them to be functioning fine. To me it was strange that I needed to replace furnace systems that had then been functioning fine for 78 years, but I was told that 50% of the heat goes up the chimney and that new furnaces would result in major cost savings. I researched this at our spectacular city library, and found that indeed the 50% value at the back of the gravity furnace vs. the 95% value at the back of a modern furnace appeared to be correct. However, the research showed that the value of the gravity air furnace at the top of the chimney was also 95%. 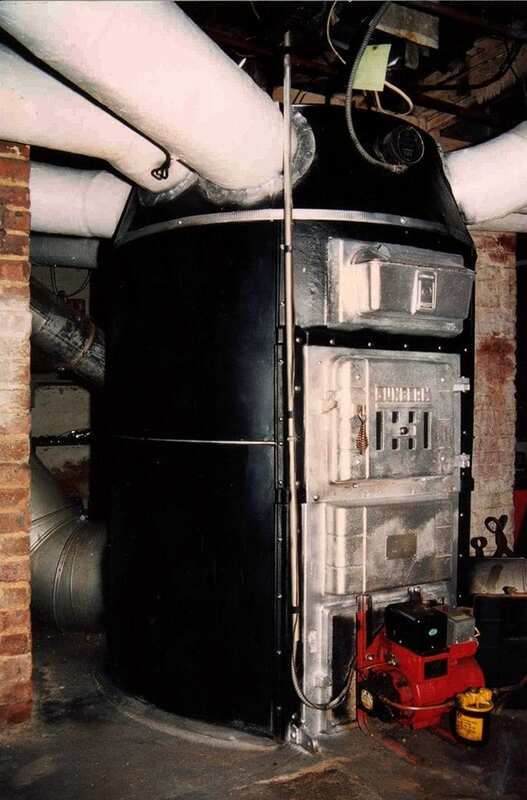 The value being quoted for a masonry chimney in cooperation with the gravity furnace, fit my situation nearly exactly – basement furnaces with a large masonry chimney running directly up through the middle of the building, approximately 35 feet tall. The chimney warms and heats both apartments in cooperation with the pressurized air, leaving the thermal value within the confines of the structure. With the cost being quoted for furnace replacement, and cold air returns from both the upper and lower units, outlandishly more than I wanted to pay, I thought I had little to lose by trying the first winter and seeing what I faced. It turned out that the old designs for this heating system, found in our library, appear to be correct as far as competitive costs. In discussion with neighbors with replaced heating systems, their heating cost were basically the same as what I was experiencing, and the room comfort from this old system was significantly superior. The only issue that I now face is the need to find some of the refractory heat diverters that go into the gas conversion units and divert the flame from the fire ring, up the inner walls of the furnace. The refractory pieces appear to both apply heat directly to the furnace wall, and then hold and radiate heat when the thermostat turns off the gas. I may end up casting them, but I hope to locate some. I have lived in structures with gravity air furnaces and cold air returns, and structures that were converted to forced air furnaces with cold air returns, and neither of these types of systems compare to the comfort of the pressurized gravity air approach. Hot water systems I have experienced provides many of the comforts of pressurized gravity air, but not the continual warm freshness in the middle of winter. This may have been a Detroit design, but it was used a lot here in this time frame. I think the unique aspects of this system is the use of outside air for combustion, and the lack of the cold air returns. 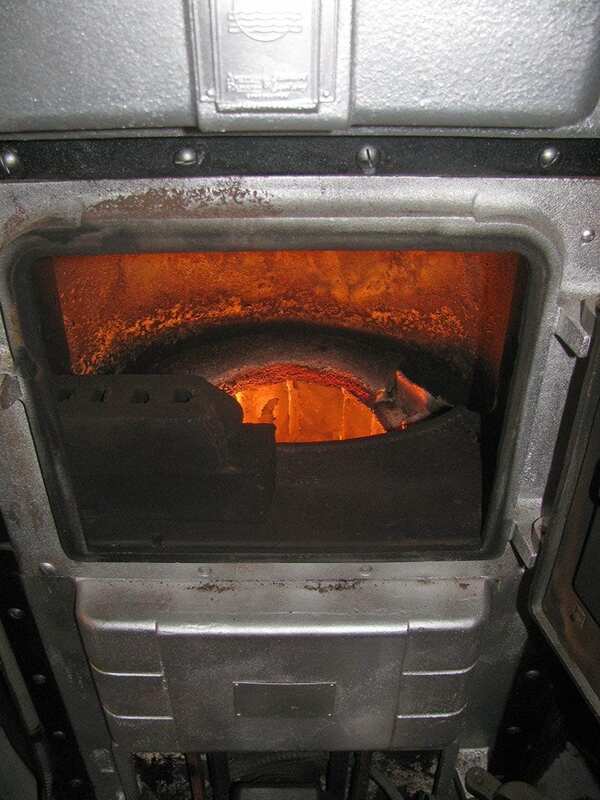 When the burners shut off, no inside heated air goes out the chimney, and no warmed inside air is drawn back through a system that sets up drafts. There is never a need to open a window to get fresh air in the middle of winter. Please subscribe me to your newsletter. We are also in the market for a gas furnace. Are you happy with the Rheem and what was your installed cost? We have owned old houses for 40+ years and enjoyed all the time spent in them. Our latest restoration project was started 10 years ago and we are almost finished. We purchased an old plantation home in West Virginia(built by George W. Washington, 3rd cousin to the President). Our county sponsored a website during the restoration. Check it out at historichampshire.org and scroll down to the Ridgedale Farm Restoration project and/or go on facebook to historic ridgedale farm. I like you attitude about old homes. Mike – that is a great restoration – I hope our readers check it out. The final cost was $8,900 after $1300 in rebates. That included $1,500 asbestos removal and $700 for basement tank removal. As stated in the comments by Diane, the air comes out too strong and actually feels cold on you. i have a early homart oil burning octopus furnace and am looking for info on how to reline the burn chamber. the old fire bricks have seen better days and i would like to change them out.any ideas ? thanks. Mike, so enjoyed looking at the pics for your Ridgedale restoration project. Any interest in pursuing archaeology at your site? And I don’t mean bottle diggers and the like. Maybe a university program would be interested, especially with the long documented history at your property. Ken, thanks for the tutorial about old furnaces. I’ve lived in some two dozen old houses over the years. All with different heating systems, including the octopus varieties. Mike, unless you want to have a furnace that requires more maintenance and parts replacements I suggest not going with a modern gas furnace. In some ways, old ways are the best ways and I agree the furnace is a work of art…the expense of running it is a drawback but I am sure it will be running long after the high efficiency units are mere memories. Perhaps one of those heat recovery units that some install on the chimney pipe to wood stoves could be used to make these old furnaces more efficient. Very interesting article! I love old houses. The house I live in now was built in 1930 and the previous owners covered the hardwoods. In that process they closed off the floor registers ( 1 cold air return & 2 heating registers) with plywood. I have removed the carpeting & am trying to find floor registers. Do you have any suggestions as to where I could find replacement registers? I’ve looked into having them made but can’t afford that. ($500 – $1000 ea) Thank you so much for any suggestions you can offer! P.S. My previous house was built in 1900 & was a beauty! Hi – wow that’s expensive. I had a heat register advertised on Craigs list for sale for $35 but it needs lots of work, and I’ve sold it! I was going to suggest Reggio Registers but I am shocked at the prices. Call some HVAC people and ask they if they have any. They are always updating furnaces and many people prefer new cheap looking replacement registers. The great old ones probably end up in the trash. Any thoughts from HVAC people out there? Ken, this is what I’m looking for but the register is too small. I appreciate your help! You left out one option: Convert the furnace back to coal. Our coal furnace keeps our 1942 house very comfortable even during power failures. The gravity air (convection) heating is wonderfully even and quiet. The minimum coal delivery is three tons, and since we typically burn two tons a year, we only pay for our heat two out of three years on average. Since our bin can hold ten tons, we could have a five year supply of heat. It is reassuring having a complete year, or more of fuel in the bin and not worry about getting timely midwinter deliveries. Yes, it is a bit of a chore, tending the fire once or twice a day, but on the other hand, coal ash provides amazing traction on the very steep section of our driveway in the ice and snow! Last benefit: It is very economical, averaging about $600/year to heat our home. You’re right – I really did not consider that option. I think that’s great you are experiencing the old days that way. Today people are accustomed to modern conveniences and having everything automatic. There is a romanticism to what we now consider inconveniences. After a while we get used to them and it becomes part of the normal old house living experience. Thanks for sharing your experience! Sorry to drag in late – love the idea of restoring to coal. Any suggestions on whom to contact in the New York area? We have an 1800s Boynton “Perfect” unit I’d love to restore. I live in Rochester, N.Y. and have heated two homes with coal. It was great! -Something so satisfying and warm! Home heating coal is Anthracite and has very little of the pollution problems associated with “coal”. There is no smell, no soot coming up into the house (people say the stupidest things) and not even any smoke coming out of the chimney! My heating bills were much lower than my neighbors. Hi.On Facebook there’s a lot of post’s and pictures of things a lot of us grew up with.They always have the caption”Remember this”.That got me remembering our coal furnace in the basement of our older house on an acreage,just outside of Busby, Alberta,Canada.I was only 2 or 3 years of age at the time ,but I remember my Mom let me stand on the stairs that led to the basement ,and watch her shovel coal into the furnace.The smell to this day,(and it’s not often your on a highway somewhere and you get a whiff of it),brings back such fond memories.I love the smell of coal.It was so nice to read this page you have here,and see that other’s liked coal too.Thanks for sharing!! Nice work-thank you for posting your project and most importantly your reasoning behind it! This is my second old home, and I find myself so envious that you had your original heating system! In my first house (3800 square feet, built in 1900), a previous owner had removed the radiators and furnace, and replaced them with electric baseboard. Running that heat was ridiculously expensive, so we wound up installing a wood/coal/oil furnace. Very cheap to run, very good heat. Only problem was that it ate wood rapidly. Fill it up, and an hour later it was out. So, we used coal to get a much longer burn. However, as nuts as it sounds- we live in the middle of the coal fields and our last Winter of using that furnace was spent searching for coal (used 5 ton per Winter). We suffered through “bad” coal that klinked and shipments of dirty that hadn’t been processed at all, prices that tripled, before we literally ran out and could find none at all, before going the heat pump route (no natural gas in our area). From that point on, we froze. 68 degrees with a heat pump is drastically different than 68 degrees from a coal furnace. In the “new” house (3300 sq feet, built in 1885) we bought, the previous owner took out the coal octopus furnace and replaced it with an electric boiler, but he didn’t understand that radiators should be winterized when leaving the house unheated, so about 80% of the radiators cracked, and he then went the heat pump route. So, I have these beautiful, cracked radiators and that are unhooked, and a state-of-the-art heat pump system that I pay a fortune monthly for, that blows cold air. 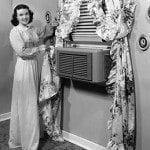 I think what most people overlook is that some of the “inefficiencies” of older heat systems had a purpose. The inefficient pipes running to the radiators actually kept the space beneath the house warm, which would have kept my floors toasty, but are now icy cold all winter. The radiators would have released heat slowly, rather than bursts of warm air followed by non-stop cold air. But, like all old house people, we just adapted. Layers, lots of layers! If we can survive several months of a 65 degree house, then the rest of the year is easy (AC is hardly even needed as the screen doors let a nice breeze through the house). There is talk of natural gas in our area in the next few years, and I have dreams of replacing the cracked rads and going the boiler route again, or at a minimum changing the electric backup on the heat pumps out to gas. We did install a small propane burner set in one of the fireplaces, so thinking that might be an option, to put gas burners in all of them and use that instead. Funny, I don’t recall ever thinking about heat, at all, before I fell in love with old homes! Yes – we adapt. Keep warm with a brick or piece of soap stone heated on the stove for 5 minutes. Wrap it in a towel and put it in your bed. A great way to warm up the bed the old way. Thanks for your comment! that’s neat but the stove has already been converted to oil. what you should do, is convert it back to coal. and use it with coal. I don’t get the preservation mentality if you, yourself, are not heating your house with coal. see ? 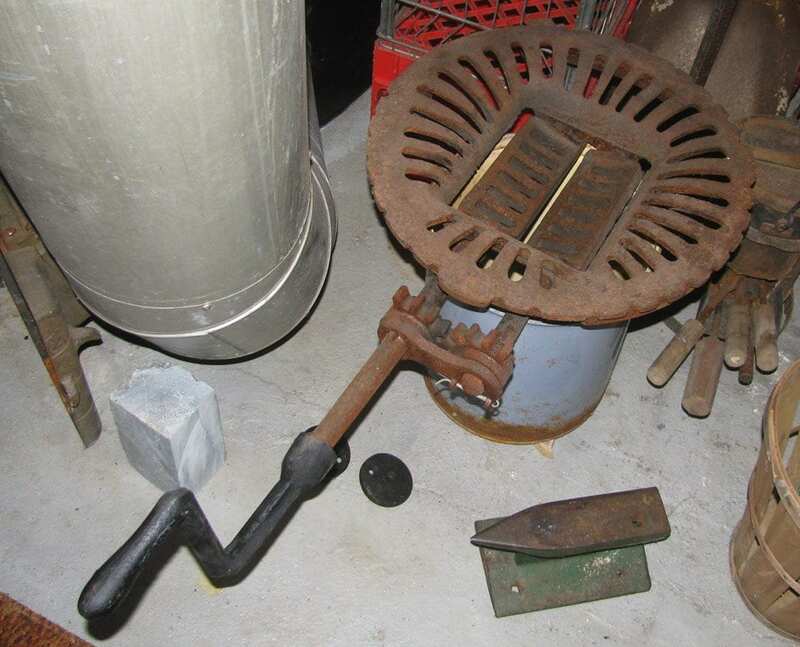 putting an easement on a coal stove that is not being used anyway, makes no sense. you’d be better off finding someone to sell it to, or give it to, who is going to actually use it. yes I heat with coal- for 20 years now. best heat you can get for the money. heats better than oil, much better than gas. modern coal stoves are very efficient. Thanks for the link. I never thought of that or knew it was possible. Looking at a home with large air duct in the floor (heating). There was a gas leak, and it is no longer in use. Who would know how to take a look at the system? Can anyone supply information about 1867 coal furnaces? A mansion, built of marble that year and still inhabited, features a large dining room against at that time the outer rear wall. That wall includes a brick chimney on its exterior, and there may have been a second chimney at the other ends of the dining room. Text data sas the dining room had “two coal stoves and two coal furnaces.” Were furnaces ever placed on a main floor with ducting to upper floors? Or is it more likely the furnaces were not in but under the dining room, in the cellar,? There is no sign of ductwork placement. Were duct every placed inside walls at that early date? Does anyone know sources/names of manufactured convection coal furnaces in that era? We have a converted coal stove and label says “Torrid & Timkin”?? Hi, I have an old coal furnace that was converted to an oil furnace. We’ve had it since we bought the house some 30+ years ago and it keeps firing every winter. We are at a cross road where we have to make a decision whether to upgrade to a new oil/gas furnace. Although the old furnace still runs, parts are getting hard to find. I need the little finger (or grills) that mount onto the ring inside the furnace. I was told they are to keep the oil flow within the channel where the ignitor is. Most of them have been rusted out and not usable. Does anyone know where I might get replacement parts (not sure it’s even possible). After reading this article, I am inclined to keep the old burner even if we get a new one. LOVED your read . Need help …. I have an octopus furnace.Model number B2. Serial number 98911. Mueller furnace. They are telling me no one makes the parts any more and I need to have it replaced. I don’t want to. Is there anyone out there that I can turn to? Live in St. Paul, MN. Any information greatly appreciated. No one makes parts for a lot of things now but no need to give up hope. Just like with an antique car, parts are fabricated or modified. It’s a matter of finding an old part or the right person to make the part. Post to plumbing and heating forums such as https://heatinghelp.com/ . The thing is to get the word out. Best of luck! They are just trying to scare you into buying a new furnace. If it is working properly now then no need to worry. If it is gas fed then parts dealing with any gas and pilot light controls are certainly available. Thanks for the tutorial about these rare old furnaces. You’re right, they are worlds of awesome, yet I had never seen nor heard of these before I came across the following photo on Facebook. Your page here taught me and many others about this crazy looking relic of the past. WOW – a sister furnace! I was just exploring the crawlspace in our basement (our house was built in 1898), and climbed into an aluminum duct. This duct, maybe 3 feet in diameter, dropped straight down 5ish feet, then turned into a concrete-walled tunnel about 2 feet high under the basement floor. I wanted to crawl in, but couldn’t because too much dirt had fallen in over the years, so I couldn’t see where – or how far – it goes. Could this be a remnant of a long-since-removed octopus furnace? It looks rather like the largest duct in the photos. If not, do have any idea what it might be? Should I clear the dirt and explore? Thanks for your help! Good question. I really don’t know. Maybe someone reading this will. You can also post on the forum – http://www.heatinghelp.com . The “Tunnel” is either the cold air return. Likely, as most, filled in after removal of the furnace, or part of an Auger coal Feed. Other than maybe some asbestos, you likely won’t find any treasure. They were coal furnaces, not pirate booties. Actually the asbestos is not a danger as long as it is encapsulated with paint. As you can see from the photos my asbestos ducts were painted. There were no broken sections where asbestos dust could escape into the air. People should not panic when they have asbestos and rush to remove what they have as long as it is kept safe. As with old historic windows, there seems to be a witch hunt for removal which is big business for the removers. Ethan…as a home inspector, I can agree with Ken. You are making a mistake by messing with the Asbestos. The EPA recommends encapsulation and not disturbing it any further. Disturbing the material will get it airborne and that is especially problematic in the case of duct work. Remediation prices are quite prohibitive. If you have a contractor that has recommended remediation over encapsulation you need a second opinion and possibly, quite frankly, a new contractor to replace the first one. I’m renting in a small apartment complex (4 units) in Los Angeles with a gravity furnace from the 1920s or 1930s .The ductwork is almost certainly wrapped with asbestos, and much of it is flaking/crumbling. Is this grounds for removal? I’ve heard that it’s only a real issue if somehow it’s falling INTO the ducts themselves, but I worry about where this crumbled asbestos ends up. Our furnace is in a basement, and I’m not even sure where any clean air intake might be for the furnaces. Is it possible that there is no dedicated intake and that the air being pulled into the furnace is simply from the basement itself, and therefore contaminated with asbestos from the ducts? From my research, it seems a bit of a long shot to convince a landlord to do anything about these old furnaces, even if there is asbestos present. Thanks for the advice. The misconception about asbestos is that any amount of it is harmful. The danger is so overhyped to where it sounds like inhaling just one fiber will kill you. Most who got sick from asbestos were those who worked with it in the factories, shipyards ETC… for many years. Looking for old sunbeam octopus furnaces for parts for my furnace that i still use and love . Just purchased an older home with a sunbeam “octopus” in working order which we are going to replace. Are you interested? We have one that puts out too much heat for our 1000 sqft home. Unfortunately I live in Volcano California and I think most people who use these live east of the Tetons but it’s free to anyone willing to take all of it. I have an old coal boiler with the name “Hercules” on it. I has a Gas insert in it and I would like to switch it back to coal. I need any direction/help that anyone can offer. Thanks ! Hi – you missed the whole point of the post. The point was that the original furnace was saved since it belongs in the house but a new furnace was installed to deter future owners from doing what you plan to do. I paid about $8-9000 with rebates. Great stuff. I’ve been wondering what it was like to heat with coal and a furnace like that. My first 7 years were in Fargo ND, where we had a gravity hot air furnace. I’m pretty sure the fuel was lignite. Unfortunately I never had a chance to ask my dad what was involved in keeping the place warm. Now I have some idea. My house has an old octopus coal furnace. It was converted to gas in the 1950s. Two years ago when I had a new gas furnace installed, the arms were removed but I still have the big furnace. I would love to get rid of it, but How???. My burning question is: Does the furnace itself have asbestos in it? People who have looked at the house, which I arm going to sell next year, are afraid that the furnace contains asbestos. Some say yes and some say no. My furnace did not have any asbestos in it. There should be someone you can call to check. Does anybody have an octopus furnace for sale or one they dont want? I’d like to restore one for our home, thanks! I do and you can have it as long as you take all of it. We had a forced air coal furnace with an automated stoker box in the 70s. That house unfortunately was an arson victim (we think) sometime in the 80s. Dad built a clinker claw with pipe and a long rod. Usedo to love standing on the heat grate. If my memory serves me, it was a big red or orange furnace. This was in W. KY.
Hi, Mike here. Bought an older home in Jackson Mi. Has an octopus furnace in the basement! In almost new condition. Has a natural gas conversion, the heat is sooo comfortable. The nat gas bill is double what a modern furnace would cost, but I did not want to give up the gradual heat rise and fall of the big cast iron fire chamber. So I designed and installed an automatic damper system on the exhaust flue that opens when the gas is burning and closes when the gas burner shuts off. I then installed medium power fans in the three cold air returns to force a more vigorous air circulation thru the furnace and controlled by a heat sensor. So no.1 when the thermostat calls for heat the flu damper opens. When fully open it triggers a relay that allows the gas to heat the furnace. No.2 as the furnace begins to heat up a temperature sensor switches the 3 return duct fans to come on. No.3 When the living room thermostat reaches the required temperature the gas shuts off and the exhaust flue damper closes almost completely, slightly open for the gas pilot lite to exhaust up the chimney. No.4 the fans continue to run until the furnace cools down, then the furnace heat sensor shuts the fans off. It still has a gradual heat and cool down cycle lasting about 45 minutes, and the hot air movement from the grills is still mild and gradual perhaps double what it originally was. In 10 degree F weather the furnace cycles once every 2 hours. In 40 degree weather it cycles 3 times in 12 hours. The gas burn time was much shorter and the cool down time was doubled, I estimate the efficiently improved from 50% to 85%. I have a holland furnace says 190A. Pretty old. Anyone want one? I’ll take pictures if interested. I moved to northern Wisconsin many years ago and found this old home on fifty beautiful acres of woods.. Had a smaller gas furnace on main floor that was poorly installed and that was the heating system which we removed. In the basement there was this big old octopus gravity air furnace that was all there but looked like it was not used for years… Had a welder come in and fix a few small cracks on the inside cast iron jacket. I installed new firebrick on the inside. I have been using this great old furnace now for twenty five years . The house is warm in the seventies all winter. People visit here and always comment how comfortable the house feels. We use hard maple firewood and placed right in the furnace will last seven hours. The name Mueller furnace company is on the furnace. Uses no electricity. In 1966, I bought a two-story 4-bedroom Victorian in Minneapolis, Minnesota, that had a gravity-system furnace converted from coal to gas. In the twenty-six years I lived there with my growing family, I spent a total of 56 cents on its maintenance, a switch that wore out and that I replaced myself with one from the neighborhood hardware store. 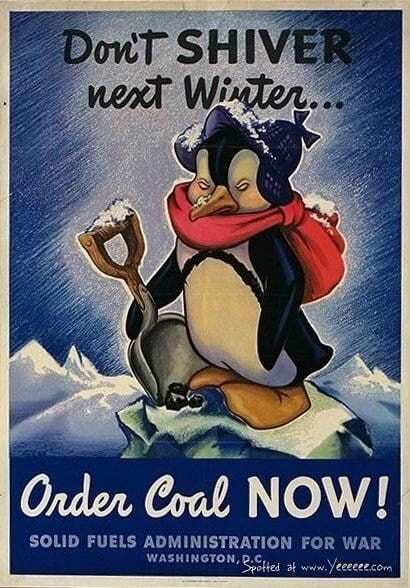 It was the the most comfortable heating I’ve ever experienced in more than 80 years of life. The heat gently wafted up, with none of the vile blasts of air I get now from a brand-new forced-air furnace and central air conditioner in my small Cape Cod (high-tech problem/low-tech solution: empty 16 x 10 x 3 cardboard boxes set in front of the two most-bothersome wall registers). The cast-iron heat registers were beautiful, as were the latticed-wood cold-air returns. Both had been installed in the floor’s 1 1/2-inch-wide quarter-turned oak when the house was built in 1896. Lemons to lemonade: I transformed the dreary basement into a play space for my sons to build their models, create animated films, etc. I painted the octopus tentacles black, glued on them round rubber suction soap holders that mimicked suckers, draped fishnet from the ceiling and built a desk for each boy against the wall. If I remember correctly, only one of the “tentacles” had a vent for heat, plenty enough for the large basement. We have one in the basement garage of our small house. We fired it up the first year we moved in. It put out so much heat, we had to open all the doors and windows. The original owner of the house said he would like it back if we ever sold. He has since passed on and his family doesn’t want it because it’s so antiquated. I think it meant more to the original owner than anybody else. I’m looking for someone to take it. I’m not asking anything other than you take all of the parts. I live in northern California and frankly, I don’t think this furnace was meant for a 1200 sqft home. Probably better suited for a warehouse? One thing that maybe could have been done to make it more efficient would have been to install one of those booster fans in the return duct like those used in modern duct work to boost the air going to a vent. That would have provided some forced air so long as there was nowhere else for the air to go other than into the ductwork. A gas conversion would have required some sort of heat exchanger to be installed which may have not been possible with that furnace while keeping it fully intact and being able to return it to coal use should a future owner decide to do that. That said it could have been possible to install an older gas furnace (one that just has a blower and burner without a control circuit board) to where the original return is the return for the furnace and the output fed into the return duct work (cut out a section of the return duct work and install furnace there) for the old furnace. You would then have forced air through the original duct work and restoration of the original furnace’s operation would only require removal of the new furnace and reconnecting the return to the old furnace. The new efficient furnaces won’t last long without problems and may be something you regret having done in a few years as things start having to be replaced. Also contrary to popular belief asbestos isn’t as harmful as people would have you believe. Most of those who got sick from asbestos were those who worked around it in ship yards and other places for many years. What is found in an old home should be ok so long as you don’t do something like eat it or deliberately shred it and inhale the fibers. that old mechanical stuff I neat. As an electrician I have worked on very old knob and tube wiring. However, unless your house is a museum I wouldn’t want it in my house. If installed properly it all was relatively safe but after 120 years who knows. Same with those furnaces. Personally I’d rather have a state of the art geothermal heat pump system like a mechanical contractor friend of mine. Now that’s a conversation piece. And it does something. I am doing some minor remodeling in an old house and have purposefully left some knob and tube in use feeding some lights. I had an easy opportunity to replace it but would rather preserve it. Really loved this article. I grew up with one of these octopus furnaces. As a child, it was scary looking into the coal room seeing this dark, glowing monster. Love the pictures. 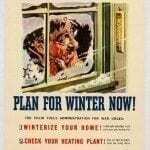 I remember in the 1960s my grandmother’s house Tripp, SD had a coal furnace. Hers had an electric auger which carried the coal from the bin to the furnace, saving her the work of shoveling the coal. Pretty fancy coal furnace! Wonderful story and comments! You all have the right ideas, for sure! I was sorry to read (again) about the prejudice against asbestos that led to its removal. Asbestos MINING was hazardous to miners, many got serious lung disease, but the hysteria against asbestos wasted billions$$ in this country, school districts and small towns forced to spend a lot to get rid of something that was harmless, inert, and not dusty. Huge waste. Bureaucrats gone berserk story. We all have Gramma stories and mine was from Chehalis, Washington where she lived in a 1908 house of modest size, octopus in the cellar. The passive heat system was wonderful. No coal, but wood from local sawmills . Gramma was the home-made bread and cookies and can- your- own- food sort. Grandpa picked the berries in our mountains , shot the deer and elk. He died. She stayed in the old house, in the cold mornings (I was 9) she clopped in her funny shoes and house dress down the narrow rickety stairs to the dirt- floored cellar, one bare lightbulb hanging precariously, chop wood, feed it into the Octopus and restart the fire. Then go up and stand over the register enjoying the heated air. The upstairs was not heated at all, nor was the bathroom. When the house warmed her cronies would come over, we all played canasta, the ladies shrieking with laughter telling stories and jokes little boys were not supposed to understand. Gramma had a weak heart, she passed in her sleep in the icy bedroom. I was heartbroken. But us kids grew up in Bellingham, Wash. which sits on a coal mine, and our big barn of a 1904 3-storey house shook in the frigid winds howling down from Canada. We burned coal, the whole town smelled of it, an unforgettable smell, I sorta liked it. House had an Octopus that had been semiconverted – a coal-munching auger fed coal from a bin into the furnace, but there was a boiler and we luxuriated with cast-iron radiators. Guess which little brat had to carry all the coal klinkers up two stairs and uphill to the alley every morning. Then my dad had the coal gobbling auger replaced with oil, cheap in 1947, it was all so .. moderne. But the furnace/boiler system stayed. (In the video above in this story I think the oil machine is FAR too noisy – bad bearings? ) Kitchen, bath, pantry and 3rd floor were unheated. I seized the latter for my space and roller-skated there. Lotsa room. 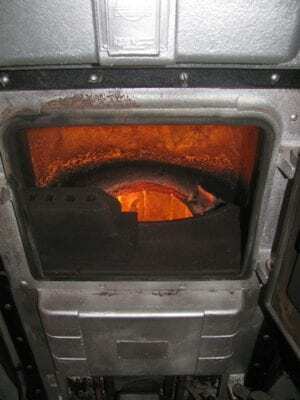 Many Bellinghamsters heated with wood, wood cookstoves were common, wood slab-wood (cutoffs from the mills) were often nearly free, just price of delivery. Wood smoke, coal smoke, and chemicals and sulfur from the pulp mill were part of our lives. Nobody died. Dad paid $8K for that old house in 1946, last time I saw it on market it was $725K. Something’s not right. A different USA then, for sure. I owned a house with one of these that had an gas burner upgrade. The guy who came to service it said I was lucky that no one had torn in out. I worked fine. I lived there for a year and rented. The tenets bought the house the next year and kept the house just like it was. I found this site after hearing the old time radio show ‘The Shadow’. It’s sponsor back in the late 30’s-early 40’s was Blue Coal. I had no idea how a coal furnace would work, and wondered if the operator actually had to shovel coal into the furnace or if there was some kind of mechanical feeder. History is a hobby of mine, thanks for sharing your knowledge about things from the good old days. We have one of these furnaces. It’s has run great for years, but it now giving us problems. The pilot will not stay lit. So many companies say get a new furnace and don’t even want to look at it. I bought an old house last year that was built in 1925. It has a relic in the basement I call the octopus furnace! So funny to see that’s really what it was called. This old gravity furnace was converted to gas at some point. Still have the coal closet, with a wooden stick thing, that has a notch in it. I was told it was for opening the door on furnace, when too hot. It is AMAZING how this this keeps working, without any servicing! I bought this house as a fixer upper for only $7600, and EVERYTHING worked- even though it was a disgusting mess! With this furnace, all I had to do is light the pilot light when I moved in. It’s amazing! I wondered how old it was. It still has the asbestos wrapped arms though. Ppl are amazed by it. Thanks for the info! Thank you so much for this article on the octopus furnace. When I was growing up in Annapolis (Maryland) my cousin had an octopus in his basement; you could see the top of the heat exchanger through the floor grate in the first floor hallway (for some reason the bonnet didn’t have a top) I can still picture that to this day, even though it was 51 years ago (1967). In the scheme of things I’m nobody to you, but I’m proud of you for what you done with your octopus and especially for your putting an easement on your house to preserve the furnace from future owners’ whims of destruction. We need more historically-minded people such as yourself to preserve the rapidly-vanishing physical history of this country. I love my gravity feed furnace. It uses natural gas and I never have a combined gas/electric bill over $100 in the winter. (OK, I do live in California) When the power lines went down one winter, those of us with these heaters did not get cold. I find that they heat the house very well and you can turn them off after a short while and rely on your good insulation to keep the house warm for a while. I would never replace it. My neighbor had to because they remodeled with another story on the house and were very sad they could not keep this heater. We had one growing up and it was fine. I liked standing in front of the vent and getting instantly warm. It does not make the noise other furnaces do and I appreciate no blowing air. Very low maintenance. Only once did I have to change the thurmocouple in 40 years. Had to change the thermostat a couple of times. The house was built in 1957 and the furnace was put in then. My Dad’s mobile home had a blower furnace and it seemed to blow cold air for a while before the hot and it chilled you before you got warm. Maybe the low insulation. I have an old Sunbeam Gravity feed furnace in my home and I Love it. However the rod that holds the heat dispersal plate has needed to be clipped off a couple of times through the years and I’ve been told that the plate is very fragile. Hi, I also need a part for my American Standard furnace built in the 1940’s. Let meknow if you find parts and where. I need a 120v ignition. Great article, my husband and I thoroughly enjoyed it. Question, instead of putting an easement on the house to keep the heater with the house, why not donate it to a historical society museum or will the entire house? I like your thinking! The house will be donated to the Historic Trust, they will put an easement on the house and then sell it and reinvest the money to restore another house and place an easement on it. If I move before I die I will place the easement on it myself. Very neat. I was just amused with finding the brass plate for the draft door control chain from my “Gilt Edge” Milwaukee furnace. The original furnace is long gone, but the pulleys for the chain still hang in the basement. i was curious how it worked. Looks labor intensive. Just found your article here on your octopus furnace. I have lived here in Mendota Illinois and own a 1908 victorian home. It still has the Wise brand model 224x octopus furnace made in Akron Ohio. Mine is not gravity but has a blower from the cold air return.The whole thing is cemented to the floor. It has been converted to oil then gas in 70’s with Timken brand conversion burner. I have only had to replace the blower motor twice and the fan limiter switch on the top of the furnace. The heating company in town where I live still services these. I was told when I moved here,there were 12 of these still in use.I have found a few of these at the local scrap yard here in town. I only know of one other one like mine with optional humidifier and a Miller brand conversion. The house was built in 1921 and heats just fine. As soon as I finish repainting mine I’ll post a picture. Interesting. As a home buyer, I wouldn’t be interested, though. I look forward to the future, not back into the past. I would be more interested in getting a home that is truly off-grid, with a windmill, solar panels, and geothermal power sources, which don’t harm the environment, and isolate me from any fluctuations in fuel or power prices. Putting these into museums would be a worthwhile venture. As a kid, I loved the Henry Ford Museum exhibits that showed life in American homes through various decades. Having it in a place open to the public is a benefit to all. I encountered a Sunbeam D-524 like this from the 40’s in a meeting house owned by our church. It is converted to natural gas and had a low speed blower/filter box added (1950’s??) to help efficiency. The blower motor fried last year and no HVAC company would touch it due to age, so I revived the blower myself for less than $80. Until then it worked fine in its original gravity configuration (filters removed for free flow). Aside from a severely corroded vapor pan it is in good working order after all these years. It has a high limit and a modern integral pilot safety valve/thermocouple and 24v control which is a step above many of the gas conversions done on these. The old beast evenly heats 1700 square feet quietly and reliably. Great article, I’m glad there are people still out there the value the history of their houses. My house was built sometime in between 1938 and 1940 and originally had an octopus in the basement. Unfortunately the second owner replaced the furnace with a modern (at the time) furnace which was then replaced with a heat pump in 2009. In my quest for restoring the house I was able to fully recreate the coal room and find a brand new wood/coal/oil fired furnace to help bring some character back to the basement. There’s nothing like firing up the furnace with a load of logs and getting nice hot air for free! I have a vintage Montage furnace that I saved from a demolition. Ladt use was wood burning. My thought was to refurbish and use on our outside porch. Most likely won’t happen. Any ideas. I have an old gravity furnace. It was probably installed in the 50’s. It turns on ok but then there is a click from the furnace and it shuts off after 5 minutes. My understanding is that the high limit is probably getting reached and shutting the heater off. I understand I need to make sure the vents are open which they are. There is no air filter so that can’t be it. Then their could be a gas valve problem. Right? I guess the fan could be dirty and not blowing air. Right? Is there something else that could be going on that I could fix? Thank you. One more question. I tried to see the manual and it would not open. It just kept spinning. Any suggestions? Thank you.